“Meditation is a practice that makes you aware of your real Self – that which you already are. It is a solo journey that brings you to experience the Divine within you. When you can meditate you will be truly alive. It is not just a technique – it is a reality. It is there inside you waiting to be discovered. For a little time each day, look inside to your centre of peace. Resting in that stillness we touch the truth and what is very real in ourselves…We can be at peace wherever we find ourselves. We learn that moment by moment, we can accept things as they are. Many people would like to meditate – but they do not know the basics. Not everyone wants the same from their meditation practice. Some want peace, some want to improve their concentration, some want relief from illnesses. Others want spiritual illumination, enlightenment. There are many benefits in stopping the mind from scattering its energy in all directions. The energy gained from meditation can be used in all walks of life. It is a multi-purpose energy. Whatever their wish, most people these days say they have no time to find peace of mind or to get to know the Truth that is hidden within. They want everything to be instant. They say they have no time, they are too stressed, they are depressed or their minds are too busy and agitated…but they are the ones who will gain much from meditation. Meditation is the best chance you have to be free of disturbance, pain and suffering. Meditation is a great medicine for so many conditions. It is a natural treatment that combats many physical and mental illnesses, makes you think more efficiently and helps you lead a happy life. The practice of meditation lets you truly understand life and helps you to discover its richness. On another level, meditation opens the door to your own higher consciousness. When you are still and go deeply inside you can experience this intense state of pure awareness for yourself. Meditation can be practised by anyone. It does not conflict with religious beliefs but leads to a greater appreciation of one’s religion and a deeper understanding of its teachings. My message is simple – the art of meditation is very straightforward. I am a very practical person and meditation is a very useful subject. 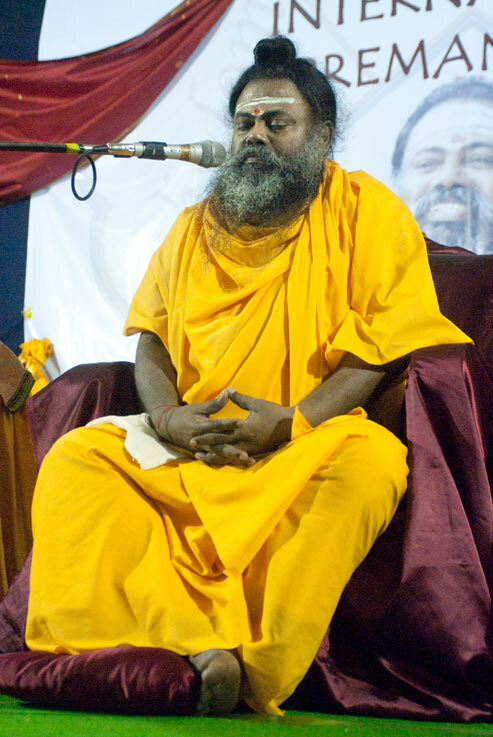 >> Swamiji taught a technique of meditation, which he called, ‘Prema Dhyanam’.